This week's Illustration Friday theme is 100%. I have to admit that I waited until some other folks submitted their illustrations before I could think of something to do with this theme. Here is my illustration...I'm going to call it "100% Repetitive". 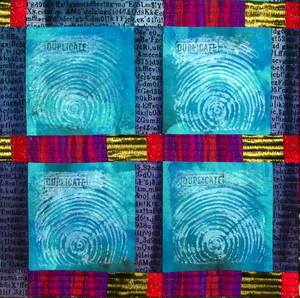 The white fingerprint looking patterns were created by stamping blue fabric with the end of a wood 4 by 4 inch board, using white acrylic paint. If you look closely, you might be able to see that I stamped the word "duplicate" in each square using an old office stamp. wow finger stamps! i've gotta learn that! i think this is perfect for this week's theme! Very nice Linda. It definitely fits the 100% theme. I never realized stamping the end of a piece of wood could look so like a human fingerprint. Amazing, I'll have to share this technique with my cubscouts. By the way I got lost at the Illustration Friday site after seeing your post about it here. I lost several hours of my day anyway. Great site!